Tax Free Bond is one of the popular investment option to earn a tax free return. In India, we have very few investment options offering tax-free returns. Public provident funds (PPF), Sukanya Samriddhi Scheme (SSA) and Tax free bonds are investment options that offer tax-free return. All other investment instruments including fixed deposits, NSCs, MIS etc., attract tax on interest income. After a wait of one year, Tax free bonds are about to hit the market again. Finance Ministry has given the mandate to the seven companies including NHAI, Indian Railways to raise fund via New Tax-Free Bonds in the financial year 2015-16. The amount allocated for tax-free bonds this financial year is 40,000 crore. These funds are expected to offer interest rate in the range of 7.3-7.5%. The maturity period of these funds will be 10-15-20 years. As discussed above government has given permission to seven different entities to sell tax-free bonds to raise capital of 40,000 crores. This fund will be used for infrastructure-related projects. List of New Tax free bonds for FY 2015-16 and allocation details are given below. What is Tax Free Bond? Tax free bond is document security against money borrowing given to issuer (Government or PSUs). Issuer or borrower is bound to pay fixed rate of interest (coupon rate) against this bond till the maturity. Interest income earned from tax free bond is exempted from taxation u/s 10 of the Income Tax Act, 1961. People often get confused and between Tax free and Tax saving terminology. Although both these terminology sounds similar there is a huge difference between these two. Tax Saving – Tax-saving instrument means an investment that saves your tax. There is certain provision made in Income tax that allows the tax payer to save tax by investing in some tax saving instruments like ELSS, Tax saving Fixed Deposit, Life Insurance premium, PPF etc. An investor can claim tax benefit by investing under this instrument under section 80C. Tax Free – Tax Free instrument means money earned from this investment is tax fee. No tax is applicable on this income. This income is not included while calculating tax on total income. An example of tax free investment instruments is PPF, Sukanya Samriddhi Scheme and Tax Free Bonds. Who can invest in Tax Free Bond? Tax Free bonds allow investment in three different category. Details of these categories are given below. How to Invest in Tax Free Bond? You can invest in tax free bonds when bond issue opens for the subscription. This issue will be open for the specific duration. Bond can be purchased in physical or in demat format. PAN card is mandatory in order to buy Tax Free bonds. The maturity period of Tax free bond is 10 years, 15 years or 20 years. In case you are in need of money in between, you can redeem this bond by selling them in the secondary market. Finding a buyer in the secondary market for the bond is challenging. Interest rate paid by tax free bond is in the range of 7 -9%. This interest is paid by the issuer at the fixed set of the interval. How to select Good Tax Free Bond? Before making an investment in Tax Free bond you should carry out an independent study. Consider following factors before making the selection of tax free bond. Credit Rating is a third party assessment of issuer providing this bond. This assessment is carried out by rating agency like CRISIL, ICRA or Fitch. You should buy Tax free bond with good ratings like AAA, AA+ or AA. Another factor which is important in the selection of tax free bond is Interest rate. You should select tax free bond offering good interest rate. Payment frequency of bond is also important factor. Higher the payment frequency means better is a bond for investment. Generally issuer pays interest rate annually. In order to compare tax free bonds with other investment options please refer to the table given below. Should you invest in Tax Free Bonds? Tax Free bond is very good investment option providing consistent tax free return till maturity, however, longer maturity period of tax free bond is limiting factor. Investing in such a long term investment option is advisable only if you have surplus money for investment. Tax free bond is less liquid and traded seldom in the secondary market. Before investing make sure that this investment option fits well with your financial goal. If you are falling under 30% tax bracket you can consider purchasing tax free bond as tax free bond provide better return compare to tax saving investment instruments. New Tax Free bonds will be likely to hit the market in month of September, 2015. I will update this post as soon as I get information about these bonds. Do share your views on Tax Free Bond. If you like this post do share it on facebook and Twitter. 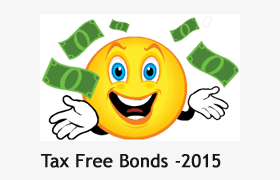 Tax Free Bonds 2015 – Should you Invest? Government Saving Bonds 7.75% Interest rate – Good for Investment? Masala Bonds Rupee Denominated Bonds – Who can invest? It appears that new Tax free bonds will have lesser coupon rate than last year’s (8.8% per annum). I will give new Tax free bonds a miss this time and rather invest in new IPOs proposed for this year.